Not as plush as expected but colors are as pictured. Woul highly recommend. Offering a striking fusion of a traditional pattern, unique color, and modern texture, this area rug is designed for style, performance and easy care. The plush pile is power-loomed of high-twist soft polypropylene yarns. While the design is inspired by antique floor coverings, the low maintenance and synthetic materials are functionally modern. Dimensions 96.0 In. X 27.0 In. X 0.31 In. Beautiful rug. It is NOT pink but more a burgundy red interspersed throughout the rug. Very pretty. This rug is absolutely great quality. I was surprised how colorful and beautiful its made. This item was shipped fast and arrived without any damages. Definitely will recommend to buy it. All the Jonathan rugs and lamps I really like. This rug has fabulous colors. I ordered one in a different size and now I ordered this one. A home run for the money. Love this rug. It matches the description and accentuates my dining room colors! Ours was a speedy delivery on a rainy day. Thanks to the sellers our rugs were well wrapped and didn't get wet at all. We ordered two, an 8 by 10 and a runner for our hallway. My favorite painting has a lot of blue tones in it, and the rugs really brought the colors out. They are just as pretty at home as they are in the picture. Good product for the money. I'm happy! I love this rug. Because of my animals I am picking it up often but that is just to take care of it. The colors are great. I love my new rug! It arrived very quickly and is perfect in my dining room, under the table. It's also the perfect thickness - I didn't want it to be TOO thick and it's not. It's just right. My only quibble would be that the rug has a strong smell and I've had the windows open for 3 days, it's still pretty strong. Loved the rug. Colors matched perfectly with red in wallpaper and blue sofa. I am so glad I read the reviews before purchasing. This definitely has more of a dark red than pink which was exactly what I was looking for. 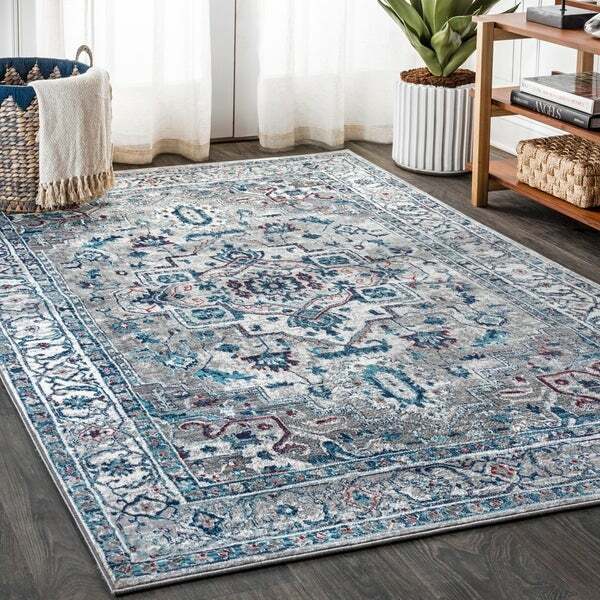 My living room suite is dark blue and with hard wood floors I wanted a blue tone rug to go under the furniture. "I need a matching 2x3 rug for an adjoining area. Is this available?" The smallest size is the 3-foot x 5-foot option. "i am interested in two rugs. A 4'x6' rectangle and a 8'x10'. Are these sizes available?" Yes, they are available under the options tab.